Conservative Leader Stephen Harper promised to introduce "tax lock" legislation during a campaign stop in Rivière-du-Loup, Que. He said the law would bar tax hikes for four years. The Conservatives are promising a four-year "tax lock" law if re-elected on Oct. 19. Speaking in Rivière-du-Loup, Que., Conservative Leader Stephen Harper revealed the plan to prohibit increases to federal income tax, sales tax and what he calls "discretionary payroll taxes," such as employment insurance premiums. The value of such legislation would be symbolic, since it would carry no consequences if taxes were raised, though the Conservatives say the law would have to be repealed by a government that wants to raise taxes. Harper said it's a way to enshrine the Conservative commitment not to raise taxes. "Obviously, the other parties are promising something very different. They won't want to pass it, they won't pass it themselves; if they get the chance they would break it," he said. The move is designed to contrast the Conservatives from their rivals. The NDP has proposed an increase to corporate taxes and the Liberals have called for an increase in taxes for the wealthiest Canadians to finance tax cuts to the middle class. Speaking Friday in Quebec City, NDP Leader Tom Mulcair dismissed Harper's pledge without mentioning it by name. 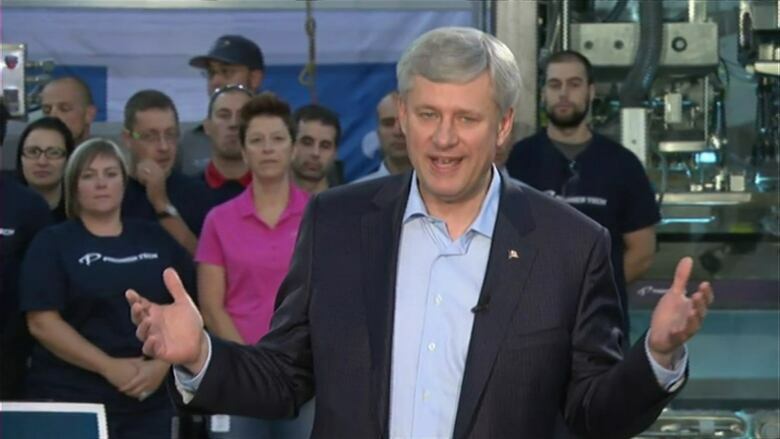 "Today Stephen Harper came up with a new meaningless gimmick," he told supporters. "Let me tell you one thing: middle class families are tired of your gimmicks, Mr. Harper, and the NDP is ready to replace you on October 19." Earlier in the day, Ontario Liberal candidate John McCallum called the promise "silly." He said balanced budget laws are common, but this was the first time he had heard of a tax-freeze policy. "Overall I think it's a gimmick, and I don't think Canadians will buy it," he told CBC News. The move is being welcomed by one tax watchdog group. "It doesn't make raising taxes impossible, but it does makes it harder, and we welcome that," said Aaron Wudrick, federal director for the Canadian Taxpayers' Federation. "Some will note that this legislation can simply be overturned by a future government, but from where we sit, if it raises the "pain" level for a politician who wants to do that, that's a good thing," Wudrick said. Why is NRCan's fuel price report suspended during election?